Bob Kurland-basketball’s first great seven-footer-was too tall 50 years too soon. Although he led Jennings High in St. Louis to two state finals, college coaches didn’t want to take the time to develop tall players-except Henry Iba, who offered Kurland a scholarship at Oklahoma A&M (now Oklahoma State). Iba transformed his giant into a scoring threat. Kurland responded by scoring a then-season record 643 points, including 58 in a game against St.Louis University, and leading the Aggies to back-to-back NCAA championships in 1945 and 1946. He was selected All-American three years in a row. Kurland also played on the U. S. gold medal-winning Olympic teams in 1948 and 1952. 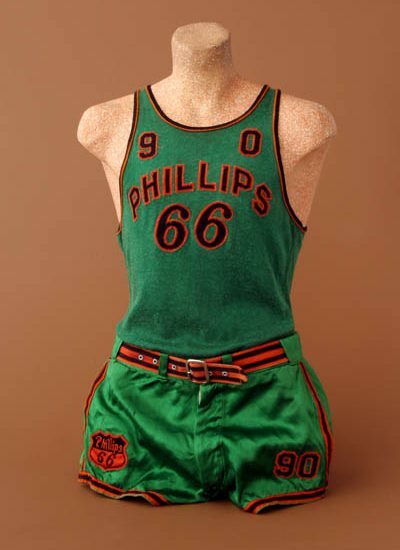 He rejected an offer to play in the newly-formed NBA and played for six years for Phillips 66ers, leading the team to three Amateur Athletic Union championships. He assumed full-time executive duties with Phillips Petroleum upon retirement. Bob Kurland was born 50 years too early. If he was 21 years old today, instead of 71, the seven-foot basketball superstar would be headed to the pros with a multi-million dollar contract. Kurland went on to being named All-American three years in a row, led Oklahoma A&M (now Oklahoma State University) to two consecutive NCAA Championships in 1945 and 1946 and then played on two United States gold medal-winning Olympic teams in 1948 and 1952. Not bad for a gawky teenager who had coordination problems as a 6-foot-6, 13-year-old and didn’t begin playing basketball until he entered high school. Kurland led Jennings High to two state basketball tournament finals and also won the state Class B high jump championship as a senior in 1942. At Oklahoma A&M, Coach Iba transformed his giant into a scoring threat by helping him develop a left-handed hook shot. In high school he was predominately a defensive and rebounding specialist. When Kurland joined the Aggies, goaltending was legal. After his sophomore year, college basketball had to change its rules. Clearing the path for the “giants” who followed, Kurland was the first to employ the dunk shot and he also became adept at tip-ins. Kurland’s scoring average as a junior was 17.1 points per game and he upped it to 19.5 in his senior season. When Oklahoma A&M won its two NCAA titles, Kurland was named tournament Most Valuable Player both years. As a senior, the redheaded Kurland scored an NCAA record 643 points. This total included a 58-point performance against St. Louis University in his final regular season game. The Aggies went on to defend their NCAA title by beating North Carolina, 43-40, in the championship game. Kurland was an A student in the classroom and graduated with a degree in Engineering. He rejected lucrative offers as high as $15,000 to play professionally in the new National Basketball League. Newly married, Kurland felt he needed a more stable feature and accepted an executive training program offer by Phillips Petroleum, a growing company in Bartlesville, Oklahoma. Kurland also continued his basketball career as the company sponsored the Phillips 66ers, a top-notch Amateur Athletic Union (AAU) team. During six seasons with the 66ers, Kurland led the team to three National AAU championships and an amazing 369-26 won-lost record. He was named AAU All-American in all six seasons. By maintaining his amateur status, Kurland remained eligible to fulfill his dream of becoming an Olympian. The United States team brought home gold medals in 1948 from London, England and in 1952 from Helsinki, Finland. After retiring from basketball competition, Kurland assumed full-time executive responsibilities with Phillips Petroleum. He went on to manage special product sales in the company’s marketing division. Nicknamed “Foothills,” Kurland was inducted into the Naismith Memorial Basketball Hall of Fame, located in Springfield, Massachusetts, in 1961. He also was named Helms Foundation Player of the Year in 1946. Bob and his wife, Barbara, are living in retirement on Sanibel Island in Florida. Their four children are spread throughout the United States in Chicago, Denver, Atlanta and Orlando. Besides Bob Kurland, basketball’s other “Big Man” in the post-World War II era was George Mikan, a 6-foot-10 center for DePaul University of Chicago. After Oklahoma A&M won the first of its two NCAA championships in 1945, promoters arranged a benefit game between the Aggies and National Invitational Tournament champion DePaul at Madison Square Garden in New York City. Kurland remembers: “The benefit was a game with a lot of hullabaloo to the point where everybody didn’t sleep well. It was for what they called the mythical national championship. Oklahoma A&M defeated Mikan’s DePaul team, 52-44, in that game and the two giants ended up facing each other four more times.